Today's image is titled "Patience". I'll let my readers/viewers decide if that refers to patience on my part in stalking so close to this frog (I believe I was pretty close to life-size magnification here), or patience on the part of the frog in putting up with the guy with the unwieldy tripod sticking a huge lens in its face. I thought I'd use this post to start a new (roughly) weekly feature on the blog that I'm going to call (for lack of a better imagination) Thursday Tips. Each Thursday I'll post a brief (or maybe not so brief at times) nature photography tip. Today I'll start with some tips on photographing frogs and toads ('cause everyone wants to photograph frogs and toads), but these tips are also applicable to many macro animal subjects. 1. Get low! Just like any other animal subject, frogs and toads usually look best when photographed as close as possible to THEIR eye level, not yours. So unless you are going for an artsy high-magnification close-up of the eyes from a top view (which can be cool), spread out those tripod legs and prepare to kneel or crawl in the mud. Get as low as your tripod allows. You are using a tripod, right?! 2. Slow patient movements are the key. I also find that approaching from the front, in full view, works best. They get nervous when you try to sneak up behind them and they will leap for it. It is okay to show them what you are doing, as long as what you are doing shows that you aren't a threat. Get low, inch forward slowly, and be very careful when re-positioning your tripod legs. With patience, luck, and a friendly frog, you can get quite close. For this shot the end of my lens hood ended up being about nine inches from the top of this green frog's (Rana clamitans) nose. 3. Work in small pools or frog ponds where they might not be quite so wary of predators. This particular individual was next to a tiny frog pond just in back of the visitor center at Huntley Meadows, rather than out in the marsh (where they are a tasty snack for herons and egrets). Most humans that visit the park (and there are a lot in this urban park) don't even know the pond is there, or don't care, so it doesn't get much human traffic either. 4. Consider using a polarizer. 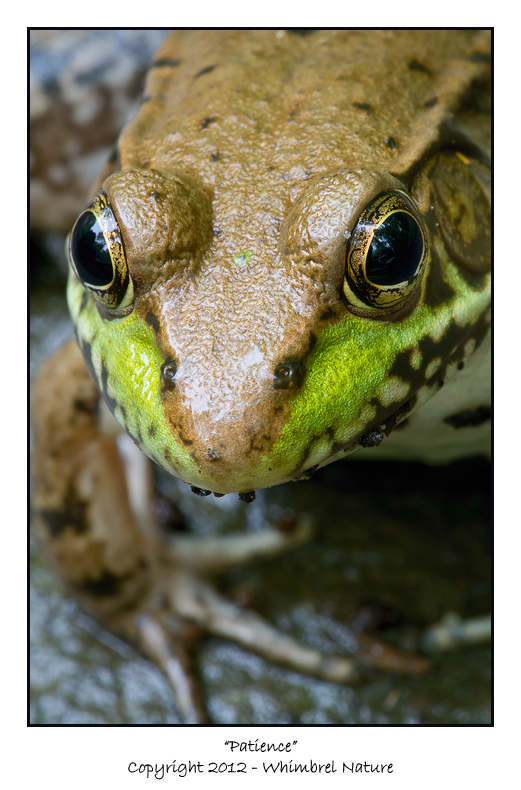 Wet frogs, wet rocks, wet vegetation, and even the water line where it meets a frog in the water can cause distracting glare and highlights. A polarizer will help you manage those reflections. In the case of this image, I made a conscious decision to shoot without a polarizer because of the conditions, but often I do use one. 5. Don't be afraid to use natural light. Sure macro flash can help you stay more mobile, but it will often give you fairly uninteresting lighting, and also the unnatural flash catch-lights in the eyes. If you use natural light, you will often get interesting reflections in the eyes, like the reflections of the tree canopy you see in this image. A frog resting by the water will usually stay absolutely still. So it is safe to use long shutter speeds in your exposure (thus keeping your aperture small for depth of field and allowing you to use a low ISO). I've personally photographed frogs with shutter speeds up to at least 1 or 2 seconds long. The only thing you need to be concerned about is that with high magnification and those really long shutter speeds, the area between the nares (nostrils) can go soft due to the rise and fall of breathing. P.S. In case anyone was wondering, here were the settings for this shot: ISO 200, f/22, 1.3 seconds, and photographed with the Canon EF 180mm macro f/3.5L lens on a Canon 7D body. A very lovely frog image Elijah and your great technique shows in the results. I also get very low to photograph birds on the ground, it can be messy but it it worth it! Very nice closeup, Elijah. Getting low is a great photography technique. That's one of the reasons I love shooting from the kayak! I stumbled across your blog thru the Natural Selection weekly paper li publication. I love it! I will be bookmarking it. Love the picture of the frog and the patience and the tips you gave! Thanks all for the kind comments. @Kim: welcome; I'm glad you liked the blog. You can check out archived posts in the right-hand panel and you can also visit my main website at www.bestnatureimages.com. Look forward to hearing from you more. Outstanding macro photograph, Elijah! Fantastic detail and color. I find images taken from a low position are so very appealing. I think I am going to have to experiment with shooting at a lower angle. Thank you for sharing your tips. I look forward to reading your Thursday posts!